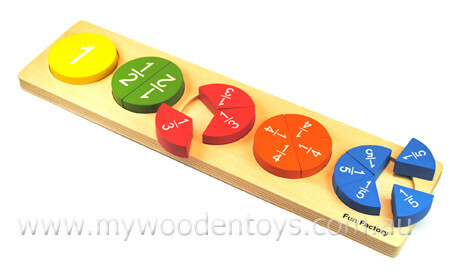 Educational Fraction Wooden Puzzle is a simple wooden numeracy aid to physically help explain the tricky concept of fractions. Five coloured circles fit into a solid baseboard. Four of the circles are divided up into fifths, quarters, thirds and halves and clearly labelled. Each circle can be taken apart, compared, stacked and counted enabling budding mathematicians to get to grips with what a fraction looks and feels like. We like this because: "Simple beautifully finished and lovely colours"